Our desktop Single Sign-On (SSO) tool makes it simple to set up your Office apps with Intermedia’s services. 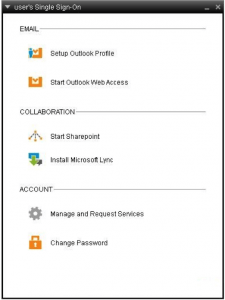 We’re pleased to announce that it now supports Office 2013 apps. With this tool, you only need to enter your password once to access your key desktop and online Office apps. Need help installing? Read our desktop Single Sign-On tool knowledge base article. Here’s what’s new with Intermedia Office Apps!